Fancy a glamping holiday in Kent? Why not book one of our pre erected Bell Tents made of good quality cotton canvas. Good strong zip-in groundsheets are provided. The pre erected tents are available from May to September when we take them down to air and dry them. 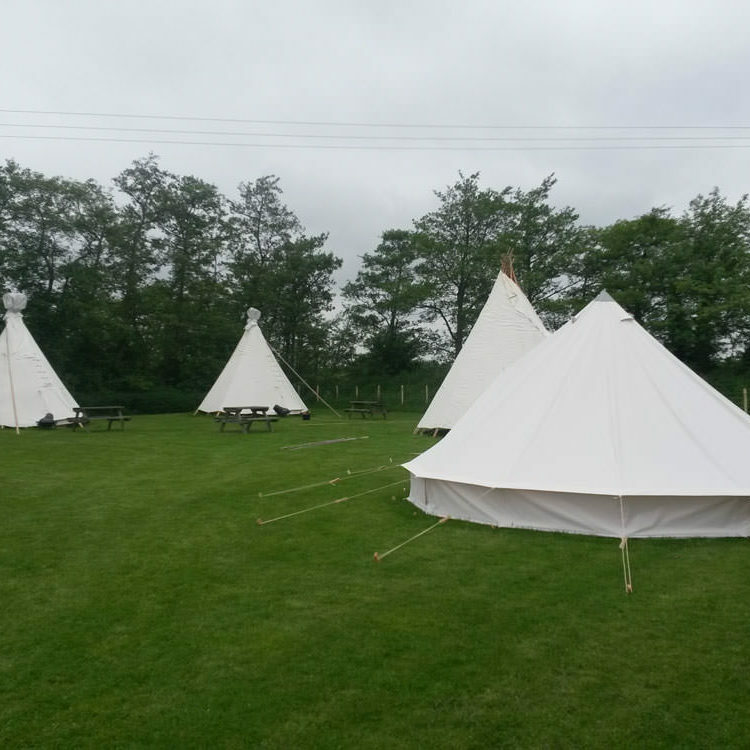 Our three English made 5m Bell Tents have a centre pole but are very spacious with good standing room etc…. comes with 4 mattresses and will sleep a mix of 6 Adults and Children (a minimum of 1 and a maximum of 4 adults). SPECIAL OFFER: 3 night midweek stay (Mon,Tues,Wed,Thurs) for £180 in any pre-erected tent. Normal price £70 per tent per night. Includes up to 4 persons. Bring all your own equipment or hire a Cook Box containing a small gas cooker and gas, saucepans, plates, cutlery, cooking utensils a kettle and much more. Making it easier for families with a small car to come camping, or why not come by train, we are 4.5 miles from our nearest stations so you may want to walk here, alternatively you could get a taxi. With each pre-erected tent you will get a fire pit and a wooden picnic table plus 4 mattresses. You will need to bring with you good quality sleeping bags (it does get quite cold at night even in July and August), torches, pots, pans and perhaps a kettle. Please note that we DO NOT allow dogs in or around our pre-pitched tents. Please see our Prices page for rates. Please read our Terms and conditions page before booking. Find out more about our quiet small campsite on the North Downs.